I wouldn't normally post a recipe accompanied by a single bad photo. I'm pretty embarrassed to even show this snapshot, poorly focused and captured late at night in the yellow light of my kitchen. But last night I found myself licking out my Dutch oven at one in the morning, putting away leftovers and unable to stop dragging my finger through this sweet/salty/meaty sauce. A recipe that good, I just have to share. This experiment was born from a need to use up a lot of odd leftovers before I leave Seattle. A long time ago (gosh, has it been a year and a half already?) I picked an unreasonably large number of Italian prune plums and froze them in gallon-size bags. They're great for desserts such as plum crunch or plum tart, but after a week of Valentines sweets I was craving something more savory. Combine that with a couple of chicken legs recovered from the back of the freezer and a variety of pantry staples, and I had an unlikely but incredibly delicious dinner on my hands. This recipe is very flexible. I had two chicken thighs and drumsticks, but you could also use bone-in breasts or even boneless pieces. Just don't crowd the pan too much; make sure all your meat fits in one layer in your pot. I used my glut of frozen and thawed plums, but you could also use a combination of plum jam and fresh plums when they're in season. Also make sure to taste and tinker as you go, adding a bit more mustard or sugar or soy sauce to taste. You won't regret sticking your finger in this sweet sticky sauce--at least, as long as it's not boiling hot straight out of the oven. In that case, you may want to use a spoon. Melt duck fat (or olive oil) in a large ovenproof skillet or Dutch oven over medium-high heat. Season the chicken with salt and pepper and brown in the hot fat on all sides. Remove from pan and set aside. Preheat the oven to 350°F. Reduce the heat to medium, add the onion to the hot pan, and saute about 10 minutes, until soft. Add remaining ingredients, lemon juice through plums. Stir well to combine and simmer for 5 minutes. Add the chicken back to the pan in a single layer and spoon plum mixture over the meat. Bake for 30 minutes, until sauce is bubbling and caramelized around the edges and meat is cooked all the way through. While the chicken bakes, cook your grain of choice. I love the nuttiness of farro, but it takes a while to cook and can be difficult to find in stores. Feel free to use quinoa, barley, or even rice instead. To serve, place a big spoonful of farro in the middle of the plate. 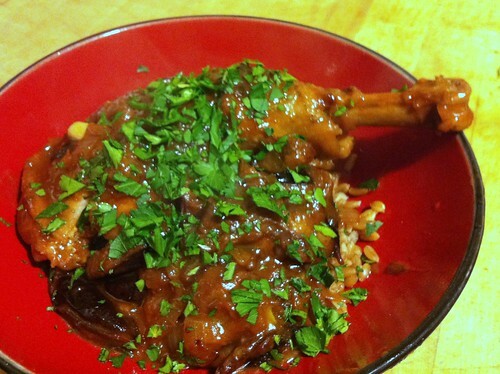 Top with a chicken leg and a generous amount of plum sauce, and garnish with chopped parsley.